If you're anything like me or Mark Zuckerberg, your earliest Facebook activity was... not flattering. In fact, I'd prefer my angsty status updates and blurry party photos were purged from the interwebs entirely. That's why I was so horrified (but also very, very curious) when I discovered there's an easy way to see the entirety of my Facebook activity to date -- from relationship statuses, to pokes, to direct messages, and all the other stuff that's changed or been deleted from my profile in the last 12 years. Dare to dig up ancient e-history? 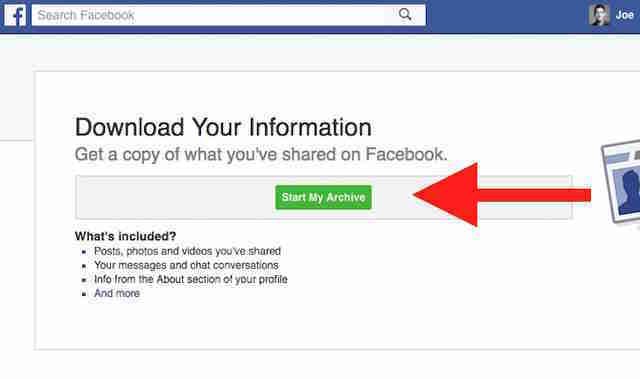 Here's how to download a copy of your full Facebook archive. 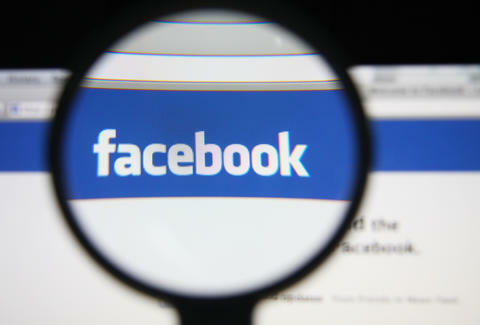 To start, you'll need to log on to your Facebook profile in a desktop browser. 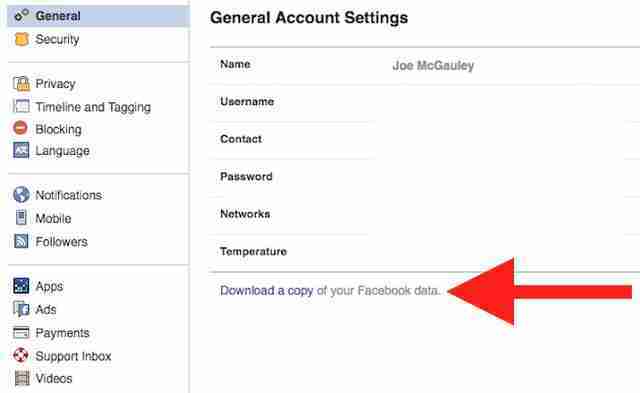 Then, head to your Settings and at the bottom of the page, click "Download a copy of your Facebook data." When prompted, enter your password, then click "Start My Archive." It will take a few minutes for Facebook to organize everything into a neat little downloadable bundle, but you don't have to wait around -- you'll get an email with a download link once it's finished. Unzip the file, and you'll see a collated digest of files divided up into two folders: "photos" and "html." 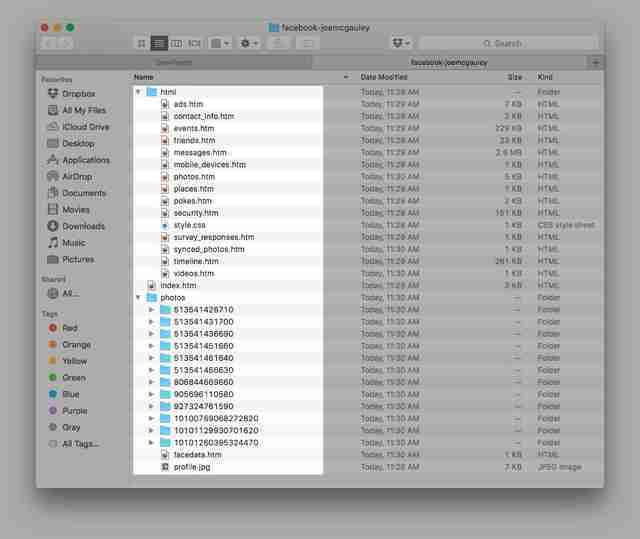 The "photos" folder contains every photo album (and thus every photo) you've ever uploaded to Facebook, including the ones that were automatically created, like albums of profile pics, cover photos, Instagram uploads, etc. You'll have to sort through to see what's what though, since the folders are confusingly labeled with numbers instead of names. 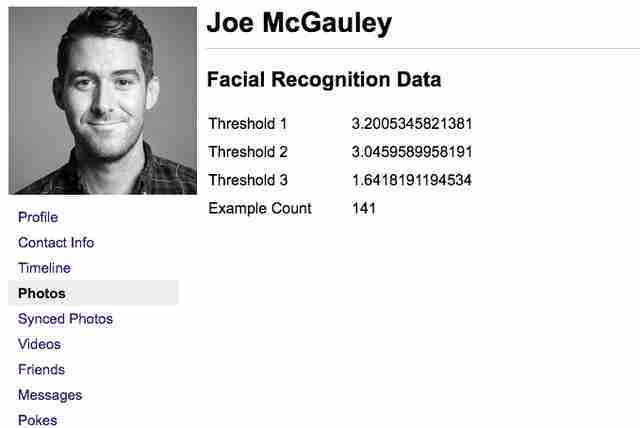 If you're curious what facial-recognition intel Facebook has on you, click "facedata." Here, you'll see the numerical "templates" its created to identify your unique facial features (if you've ever wondered how the site seems to magically suggest photo tags of people, this is how). mobile_devices: Something about "mobile network connection quality." Frankly, I have no idea what this is about. synced_photos: A now-defunct feature, this allowed you to save photos privately to Facebook, then select which you'd like to share publicly at a later date. So, if you ever did this, those photos will presumably show up here. Hopefully if you're a nice, clean, decent human being, you'll walk away saying, "Oh, what a lovely little time capsule!" As for the rest of you, try not to stew too long in your shame and embarrassment. It can't be any worse than your old Myspace photos. Joe McGauley is a senior writer for Thrillist with a rather prolific poke history.